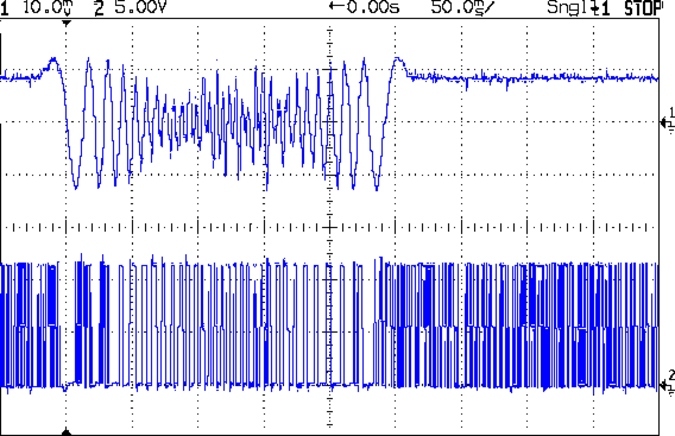 The motor turns at 375 RPM, which means each stepper generates 12 Vpk back EMF, so the A4988 driver has absolutely no control authority near what should be the zero crossings of the current waveform. The taller waveform along the bottom of the first scope shot comes from the H bridge output tending to increase the current waveform, so it’s applying a solid +24 during the flat top section and not only gets no traction, but actually loses ground just after the middle of the screen. Eventually the back EMF drops and the current begins increasing, but long after what should be the 600 mA peak current where the driver flips the H bridge and begins trying to decrease the current. 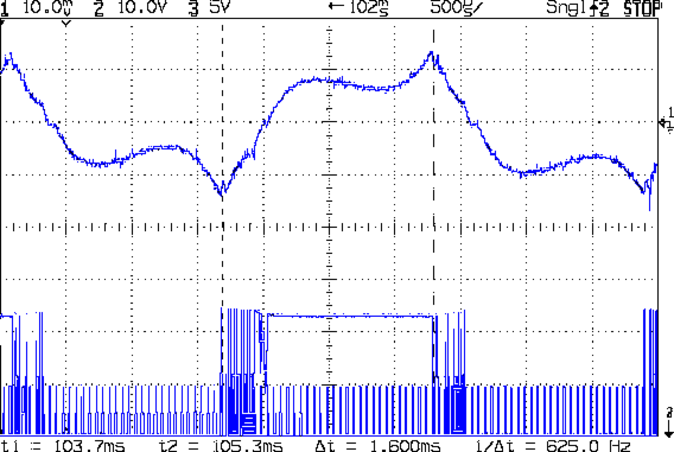 The step pulses tick along at 50 μs intervals, with only two driver PWM pulses for each one. 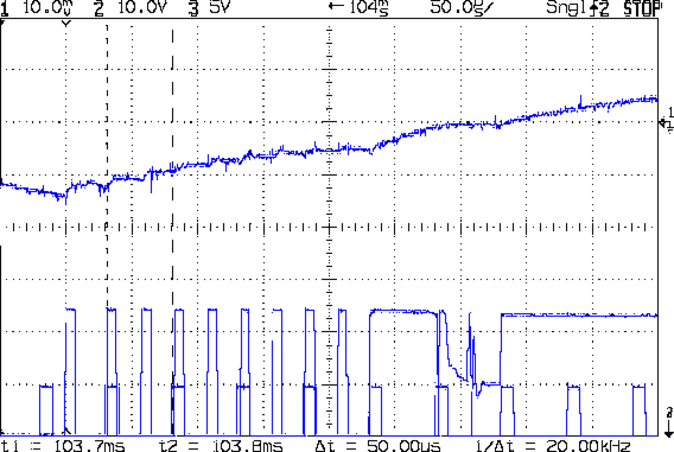 It’s facing something over 9 V of back EMF from the motors at that speed. 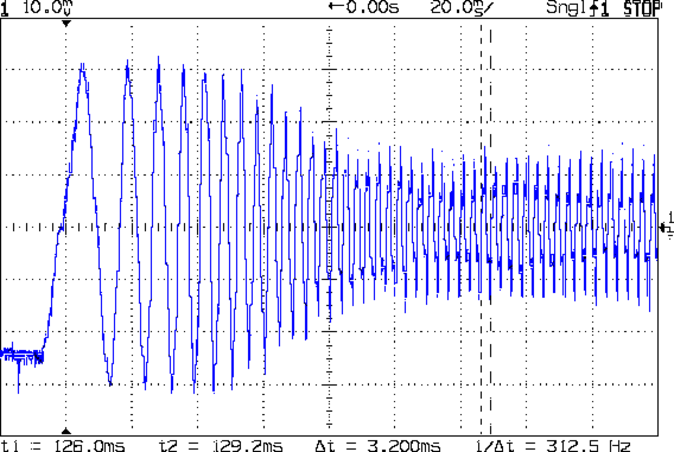 The chaotic spikes near the middle of the current waveform show where the rotor dropped out of lock with the driver and begins shoving the current around. This entry was posted on 2018-02-02, 07:55 and is filed under Electronics Workbench, Machine Shop. You can follow any responses to this entry through RSS 2.0. Both comments and pings are currently closed.